Outside a high-rise office building in a clean and quiet part of the city, a scruffily dressed bearded man ambled down the quiet street. He paid no attention to the locked metal and glass building, but continued on his way down to the busy boulevard at the end of the block. The sign on the front entrance to the metal and glass building proclaimed that the offices had closed over an hour ago; only the lights on the top floor still shone, joining the night lights of Cleveland. A shadow flickered against the closed blinds of the corner conference rooms on the top floor, a formless shape outlined against the closed blinds. It slid along the window until it could be seen no longer in the abandoned room. Suddenly the room went dark. Methodically, the shadow appeared against the shuttered windows of the top floor. One by one, it slipped along the windows before the lights shut off until only the middle room remained lit. Although the lights of the room were still on, the chairs stood immobile at the end of a large wooden table, its glossy surface reflecting the florescent lights above. The wood and glass door opened slowly and an oblong shaped shadow filled the doorway. An arm, draped in dark cloth, reached over to flip the switch on the wall, plunging the last room into darkness. "Excuse me!" protested a shocked voice. The hand immediately flipped back on the light. Seated at the far end of the table by a projection screen was a smartly dressed, if tired-looking, woman surrounded by papers and manila folders. "Sorry, Bonnie," apologized Hal, as the embroidery on his large navy blue uniform identified him. "Didn't see ya there. Workin' late?" "Apparently," she said dryly, gesturing at the mess surrounding her. She said nothing else, but turned her attention to the paper nearest her, casually glancing at her watch. "Well, uh, I'll leave ya to your work, then," Hal mumbled, put off by Bonnie's distant attitude. He let the door ease shut behind him with a small click. With all the lights off in the conference rooms, he turned around to face the elevator and pushed the down button. Hal turned from the elevator and stared down the dimly lit hallway. The overhead lights were dimmed for the night and the brightest light was the green emergency exit sign at the end of the corridor. The elevator paused on the ground floor and Hal shifted his weight impatiently from side to side in front of the metal doors. He jingled the keys at his waist, clipping and unclipping the ring from his belt, humming tunelessly. Finally, the elevator arrived and the doors slid open with a metallic ding. Hal moved forward to step inside, but a noise behind him, like the click of a door shutting, distracted him. He peered down the hall, one foot inside the elevator, but could see nothing in the faint lights of the hall. Hal even tried to swivel around to see the door immediately behind him, but keeping the elevator doors open and looking behind himself proved too difficult. With a shrug, he entered the elevator. The doors closed silently and the red LCD numbers above the elevator ticked down until they hit 1. The hall remained dimly lit and silent in Hal's wake. Then, the red display above the elevator began rising again, from the first floor back up to the top floor. Smoothly, the silver doors slid open again to reveal an average-looking man accompanied by four other men, who looked a bit worse for the wear. The leader of the group headed straight for the lit conference room and opened the door, the four others immediately following. Bonnie looked up as they entered the room, shuffling papers. "About time," she snapped, setting the pile in her hand to the side. "Did you stop for dinner on the way?" "That janitor probably would have given me a heart-attack," the leader sniffed. His followers looked confused and one of them said, "Heart-attack? But we're already dead." Both Bonnie and the man rolled their eyes. "I hate working with leftovers," Bonnie sighed. "Get in here, Gretz," she waved her hand toward her end of the table. Gretz and his four sycophants obediently took seats to the left and right of the real estate agent. "Said you had a job for us?" Gretz asked, settling himself in. "Nice room, by the way. But you didn't have to go and arrange it just for us," he smiled mockingly. "I didn't." Bonnie pulled out a manila folder from under one of the piles surrounding her. She flipped the cover open to reveal an eight by ten black and white photo of a teenaged boy with messy dark hair, which she handed to Gretz. "This is one of the younger members of the self-styled Watcher's Council, a student and coven member. They call him Jeffrey," she informed the five men. "We want you to bring him to us. Unharmed," she stressed the last word, looking directly at the four other men. "I got payback due to them for what they did to Seward and the rest of our gang!" one of them protested. "If Jeffrey, or any of the other Council members, is harmed, you will answer to me," Bonnie's eyes bored into the protester's. "The boy is needed intact and undamaged." "You want us to go into the Council and grab a boy from right inside?" Gretz sounded incredulous. "That's suicide!" Bonnie coolly shifted her gaze to Gretz. She leaned forward and casually placed a hand under the table on Gretz's knee. She tightened her grip and spoke quietly. "No, suicide will be your only alternative if you fail us in this. A great deal rides on the capture of this boy and you are expected to deliver." As she spoke, clouds of smoke began to issue from Gretz's knee from underneath Bonnie's hand. Gretz struggled to escape the burning, but Bonnie held tight and he writhed in vain. Abruptly, she left go and tossed the crucifix she'd been holding on the table as she neatly folded her hands. Gretz patted his knee with both hands, trying to stop his flesh from smoking. His followers looked shocked and scared and Gretz, too, looked shaken. "Besides," Bonnie added, much more cheerily, "you are already dead." "Hey! How are my two favorite female Bobby Fischers?" Andrew inquired of Willow and Rowena, flopping down into a chair nearest to the pair with a pizza box clutched in both hands. "Winning," Willow grinned up at her opponent, who was contemplating her next move. Willow and Rowena sat across from each other at a small table, a game of chess set up between them. "Game's not over yet," Rowena reminded Willow as she moved her black knight forward. "Well, you know what they say about chess!" Andrew tried to shift the two women's attention toward himself and away from the game. 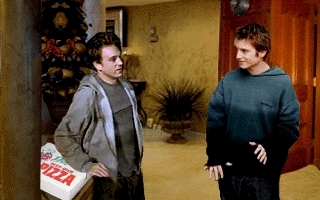 "It…uh, requires sustenance," he shook the pizza box at Rowena and Willow. "No thanks," Rowena declined, smiling briefly at Andrew before turning back to the game. "I'm good, Andrew." Willow did not even bother to glance up, but continued studying the board. "Uh, well, if you change your mind," Andrew said slowly with a dejected expression on his face. Neither Willow nor Rowena looked up. "I'll, uh, be…somewhere." He opened the lid of the box to reveal an untouched pizza and pulled out the first slice. Chewing mournfully, he left the lounge, leaving the chess players alone. "So how are you and Kennedy doing now?" Rowena asked casually, as Willow continued to think on her next move. "Since the ritual, I mean." Willow looked up sharply, looking for some kind of indication of the reasoning behind the question. Finding only concern, she turned her attention back to the game. "Trying to throw me off my game?" Willow retorted lightly. "That means 'Not good'," I take it. And I'm not trying to get you off your game," added Rowena, smiling. Willow shrugged. "Not bad…not good though, either," was her only comment, and she seemed saddened by just thinking about it. "Have you two talked about it at all?" "I've tried," Willow said obviously frustrated. "But all I get is slayer stoic-y talk. The standard, 'I'm fine', 'Don't worry'. Well she's not fine but damn if she'd talk to me about it." "You really are trying to throw off my game," Willow countered. Rowena grinned for a moment before turning serious. "Well, I understand why you did it and I fully supported you at the time but –." "But what? Now you don't? Gee, thanks." "No, I still think you did the right thing but sometimes the right thing isn't always the easiest on the people we love. You're a Wiccan now and don't feel bound to the Judeo-Christian fundamentals of life. She's not so it's gotta be tough on her, Will." "Damned if I'd know – because, after all according to her everything is fine," she answered with sarcastic frustration. "But it's not and I understand your exasperation. I tried to talk to her and I –." "You?" Willow asked slightly shocked. Rowena paused a moment and then simply nodded. "You, Rowena Allister, tried to talk to Kennedy? These are the same two people whose animosity is about as deep as the Atlantic, right?" Rowena grinned. "I wouldn't say my association with Kennedy is that tumultuous – well okay it is from time to time but still... Of course, I didn't say I succeeded either. Giles tried too and didn't have much luck but...we're concerned – for both of you actually." "I'll be okay. A-and so will she...I just wish she'd open up." "I can see that," Rowena answered sympathetically. "But maybe waiting for her won't work." "Maybe you need to confront her." "A confrontation? No, I'm not confronty girl. I'm more 'bury my head in the sand and hope it goes away' girl." Rowena grinned at the analogy of Willow's ostrich mentality. "This isn't going to go away Willow." Willow bit her tongue, holding back a reply. She knocked over Rowena's queen with her own and removed it from the board. Rowena moved her king away from Willow's queen, but Willow closed in and announced, "Checkmate! I win!" She bounced up from her seat singing, "I won! I won! I won! Woo!" She grinned, continuing to bounce across from Rowena, who had a wry expression on her face. "Good to know you don't gloat in an unseemly fashion," Rowena remarked, a matching grin spreading across her face. "That was plenty seemly," defended Willow. "I never beat Giles, so I gotta get my jollies where I can." "You won, Willow?" asked Jeffrey as he walked through the room, looking perfectly coiffed. "You betcha!" the witch beamed. "Good job," Jeffrey smiled at her as he walked out into the entrance area. "Jeff!" Andrew crowed, descending on the teen from by the stairs, pizza box still in hand and mouth full of pizza. "Want some pizza?" "Oh, sorry, Andrew, but I got, uh, a date," Jeffrey declined, looking slightly uncomfortable. "Oh," Andrew's face fell. "Well, uh, have fun…I guess…"
Jeffrey grinned, "I plan to." Noticing that Andrew still looked dejected he took a few paces forward. "Hey! Whadya say we go to the movies next week – guys night out? I'm dying to see –." "Lord of the Rings: The Return of the King?" Andrew asked hopefully. "It opens next week. I can get advance tickets." Jeffrey nodded with a smile as Andrew gave a small clap of excitement. With a backwards wave, Jeffrey left Andrew standing in the doorway. He walked quickly down the sidewalk, looking confident. The expression on his face perfectly matched the black and white photo held by Gretz, standing under a street light one building down. Unbeknownst to Jeffrey, Gretz and his four followers set out down the street, a few moments behind him.